A new addition has been made to the 420J product range from ebm-papst. 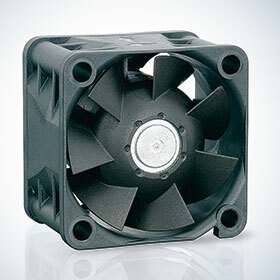 The tube-axial fans withstand temperatures down to -40°C and are now also available for 48 V d.c. voltage input, IP68 degree of protection and EMC protection class B. So far, the 40 x 40 x 28 mm product range has been designed for 12 and 24 V d.c. voltage inputs. Thanks to the new 48 V version, the fan can also be used for applications operating as standard with 48 V, such as base-stations in telecommunications systems. Special software and a special circuit design ensure reliable startup and operation at extremely low temperatures. A characteristic feature of all versions is their high level of energy efficiency. The electronics of the 48 V d.c. version have been optimised to comply with the more stringent EMC Class B limit values for both conducted interference and radiated interference. There is thus no need for separate protection filters and shields. For applications involving greater dust, moisture and salt fog impact, the fans can optionally be supplied with IP68 degree of protection (dust-proof and with protection against continuous submersion). Not only the electronics, but also the winding, is then encapsulated in plastic. The fan’s features facilitate use in outdoor applications such as cellular base stations or frequency converters for satellite transmission. They can also be used in IT servers and routers, as well as for laser cooling.